Which registered Scouter in your unit is often invisible to your membership but is essential to its success? Here’s a hint. This Scouter is also a member of your council committee and has a vote in council affairs. If you guessed the chartered organization representative, you’re correct! You’re probably also well versed in unit adult leadership. 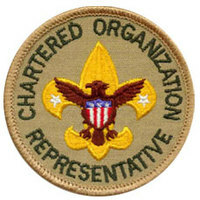 Every unit holds a charter from the BSA, and that charter is granted to a community organization such as a VFW post, fire department, school, church or service club. One member of that organization is appointed by its executive officer to be the liaison between itself and the unit. The chartered organization representative (sometimes known by its position code, CR, or the abbreviation COR) has several responsibilities. The one that we’re most familiar with is the approval of adult leader applications. The chartered organization approves the adult leadership selected by the unit committee, and often will conduct its own reference checks to ensure that unit leaders are suitable to carry out the organization’s aims as well as those of Scouting. 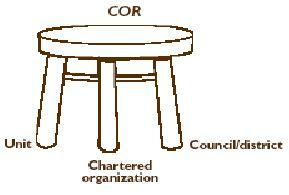 Perhaps the best way to think of the COR’s place is as the seat of a three-legged stool. The seat joins together the three legs, which are the unit, the chartered organization, and the council, and the COR acts as a conduit between these three entities. In the case of the chartered organization, the goal of the COR is to report to the organization about the unit’s programs, needs and successes regularly, and to share with the unit the needs and desires of the chartered organization. With respect to the council, the COR updates the chartered organization on the latest information from the council and district and vice-versa. The COR is also a voting member of the council and district, and since there are more chartered organizations than district and council committee members at large, control of the council belongs to the chartered organizations. Encourage unit leaders to take training to help them deliver the best possible program to the youth of the unit. Promote well-planned unit programs to keep youth interested and engaged. Organize enough units to meet need so that all youth in the area have an opportunity to join Scouting and enjoy its benefits. Promote recruiting new youth members to spread the aims and values of Scouting to as many youth as possible. Encourage transition from one program to the next so that youth carry forward the fun and adventure of Scouting and remain engaged. Assist in annual unit charter renewal by arranging charter review meetings with the district professionals, the unit commissioner and the head of the chartered organization, and by facilitating charter agreement approval by the executive officer. Suggest Good Turns that benefit the chartered organization and its community so that Scouting’s values are put to work. Encourage regular unit committee meetings so the unit leadership has the support it needs to carry out a quality program for youth. Encourage active outdoor unit programs to keep the “outing” in Scouting. Promote earning advancement, including religious awards, and recognition of leaders in order that Scouts get the most out of the program and so unit leaders are valued and encouraged to serve youth to the best of their ability. Approve unit finance policies to help manage the unit’s assets responsibly and to verify that its money-earning activities meet the organization’s standards as well as those of the local council and BSA. Represent the chartered organization to the district and council to keep them abreast of your organization’s aims and goals for its youth program and to encourage participation in council and district events. This is a rather long, but not necessarily all-inclusive, list. Unfortunately, there are too many chartered organization representatives who are only seen or heard from at charter renewal time. These individuals would benefit greatly from improved engagement, and so would the unit and council. As a benefit to chartered organization representatives who aren’t directly involved in the Scouting program, there are many resources available to assist the chartered organization. First and foremost of these are the volunteers and staff of the Scouting district, including the commissioner staff and the district committee. A unit commissioner is assigned to each unit to provide a “customer service” function. Think of your unit commissioner as a person who can help you understand the Scouting program and untangle the knots you are likely to encounter in managing the organization’s involvement in Scouting. CORs are always welcome at the district committee’s regular meetings, where they will find the key people who support programs at the district level. Help is also available from the Scouting professionals who support your district. As with all positions in Scouting, training is available. Youth protection training is required, of course, and the leader training for the Scouting programs that the organization holds charters for are beneficial as well. There is position-specific training by way of a supplemental training module that can be delivered by district training teams. If your district doesn’t offer the training, CORs and others can read the training outline to get the essential information about the job. And the online course This Is Scouting gives an overview of all Scouting programs. If you’re a unit leader, don’t let the chartered organization representative be the “forgotten Scouter”! 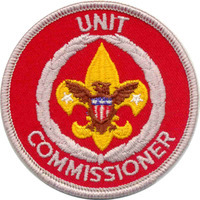 Invite him or her to attend your committee meetings, to drop by a pack or troop meeting and even go camping with the unit. Keep him or her informed about what’s going on in the troop or pack, and ask for advice and support from the chartered organization. In doing so, you’ll be seeing your COR more than just once or twice a year.